Catalans love, love, love their broad (fava) beans! So hardy and easy to grow, they set up the vegetable garden for the rest of the summer’s plantings by fixing much-needed nitrogen in that deliciously rich Catalan soil. 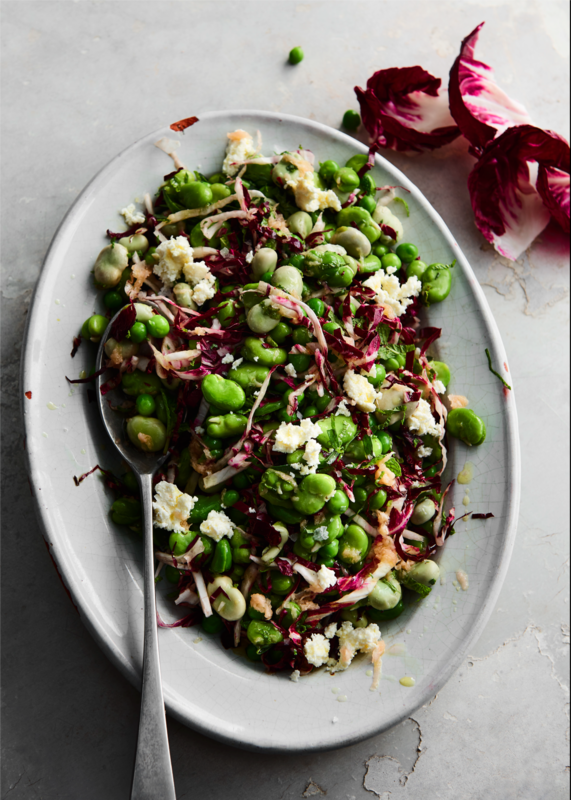 Inspiration for the flavour combinations in this dish comes from one of my favourite restaurants, Can Fabes located in the beautiful broad bean-growing lands of Sant Celoni, situated between the Montseny and Montnegre massifs. 1 Bring the vegetable stock and two tarragon sprigs to the boil in a medium saucepan over medium–high heat. 2 Blanch the broad beans for 2 minutes then, using a slotted spoon, remove from the stock and immediately transfer to a bowl of iced water. Remove the outer skins of most of the larger beans, leaving the smaller ones intact for a touch of bitterness. 3 Bring the stock back to the boil and blanch the peas for 4 minutes, then strain and cool in the iced water. 4 Finely chop the remaining tarragon leaves and place in a medium bowl with the blanched broad beans and peas, mint, a pinch of salt and pepper and half the olive oil. 5 In a separate bowl, combine the vinegar, ginger, lemon juice and remaining oil, then toss through the shredded radicchio. Mix this through the broad bean and pea mixture. 6 Transfer the salad to a serving platter and dot the queso fresco or ricotta over the top. My favourite meal at the Can Fabes – owned by three-Michelin star chef Santi Santamaria, who has since sadly passed away, was an aspic-like jelly packed full of teeny-tiny, bright green podded baby broad beans with the mild, fresh essence of ginger. So clean and unforgettable. Oh dear, I know, I forgot to attach them. Honestly, I work so quickly it’s a surprise it doesn’t happen more often (it doesn’t help that you post the method before the ingredients in the computer back end). Hey! I thought you were still in Marlborough? Enjoy those beans. HaHa! Too speedy, posted it before checking. Ingredients now attached. Enjoy it Sue.